The Khomul Ghijek is an ancient Uyghur bowed instrument from North Eastern Xinjiang, made mostly of mulberry wood although some are made of iron or copper. The head of the instrument is in the form of a cylinder. The instrument´s long neck extends through the center of the head. The face of the head is covered with, either, goat or snake skin. The instrument´s length is about 90 centimeters and the diameter of head face, 12 centimeters. 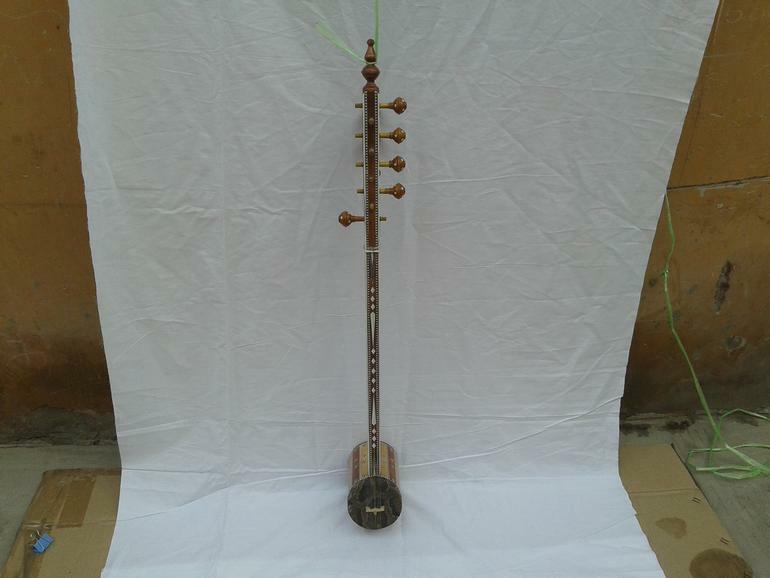 The length of the cylindrical head is 18 centimeters and the bow (which is used to play the instrument), is some 65 centimeters long.The instrument has two bowed strings and several sympathetic strings. It is first rested in an upright position on the top of the left leg and played by pressing the strings with the left hand while bowing the strings using the right hand. An interesting bowing technique is used in that the bow string is positioned between the two playing strings. Copyright © 2019 Kashgar Music and Carpet Store. All Rights Reserved.